^ "Jaime Herrera: Staying 'true to the principles'". The Columbian. 2010-07-23. Retrieved 2019-01-05. ^ "Represent". ProPublica. Retrieved 2017-04-03. ^ Bycoffe, Aaron (2017-01-30). "Tracking Jaime Herrera Beutler In The Age Of Trump". FiveThirtyEight. Retrieved 2017-04-03. ^ a b "Herrera Beutler, Haugen face off". The Columbian. 2012-10-15. Retrieved 2017-04-03. ^ "Another Republican Against Trumpcare: Washington State's Jaime Herrera Beutler". The Stranger. Retrieved 2017-04-03. ^ "State Republicans saying little — if anything — on Trump's executive ban". The Seattle Times. 2017-01-29. Retrieved 2017-04-03. ^ Moorhead, Dana Bash, CNN A. series produced by Abigail Crutchfield, Jackson Loo and Jeremy. 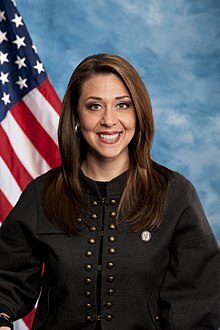 "How Rep. Herrera Beutler saved her baby". CNN. Retrieved 2017-07-29. ^ Dake, Lauren (May 19, 2016). "Herrera Beutler gives birth to baby boy". The Columbian. Retrieved 5 December 2018. ^ Theen, Andrew (June 18, 2017). "Father's Day: Meet Dan Beutler, a Congressional spouse, stay-at-home dad and organ donor". The Oregonian. Retrieved 4 December 2018. ^ "November 02, 2010 General Election". Washington Secretary of State. Retrieved 2017-01-17. ^ "November 06, 2012 General Election". Washington Secretary of State. Retrieved 2017-01-17. ^ "Elections & Voting". Secretary of State. Retrieved 2017-01-17. ^ "November 6, 2018 General Election". Secretary of State. Retrieved 2019-01-17.